I have a pretty cool interactive map below that will let you graph the unemployment rates based on parameters that you can choose. 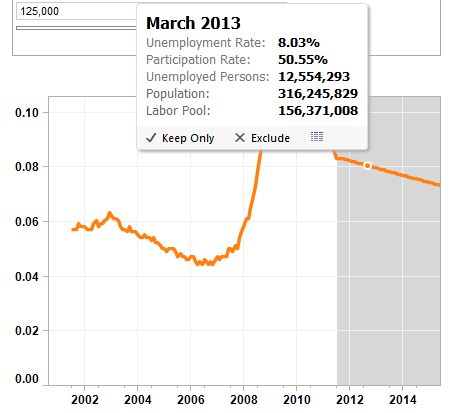 First let's take a look at the current unemployment rate and a discussion of the parameters that define it. The BLS says the unemployment rate is 8.3%. There is much recent debate over that number, and many do not believe it. Regardless, this is where we stand as of Friday March 9, as reported in my post Nonfarm Payroll +227,000 ; Unemployment Rate Steady 8.3%; BLS vs. Gallup. In the last year, the civilian population rose by 3,584,000. Yet the labor force only rose by 1,569,000. Those not in the labor force rose by 2,014,000. In February, the Civilian Labor Force rose by 476,000. In February, those "Not in Labor Force" decreased by 310,000. 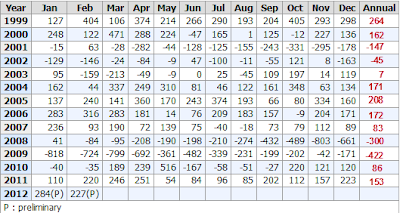 If you are not in the labor force, you are not counted as unemployed. The key is not how we got here, but rather where the unemployment rate is headed next. Bernanke estimates it takes about 125,000 jobs a month to keep up with population growth. Demographically speaking, I agree with that number but it should decline over the next few years as boomers retire. The math is straight forward, all things being equal (they aren't) the labor force should rise by about 1.5 million jobs per year. Recall that the unemployment rate is based not off the payroll survey, but the household telephone survey show above. 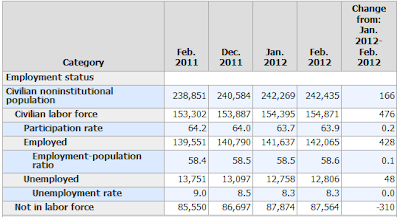 This past month the BLS reported a "seasonally-adjusted" gain in employment of 428,000 workers. The unemployment was steady because the BLS reported a "seasonally-adjusted" gain in the civilian labor force of 476,000. Both unusually warm weather and questionable seasonal adjustments are at play. The following numbers are from the "payroll survey" not the "household survey" but they may help give you a perspective on jobs. Chart courtesy of BLS. Annotations in red by me, numbers are in thousands. At the height of the internet bubble with Greenspan stepping on the gas out of irrational fear of Y2K problems, the economy managed to gain 264,000 jobs a month. At the height of the commercial real estate bubble with massive store expansion, the economy added 172,000 jobs per month. Use those thoughts and whatever else you wish to decide how many jobs the economy will realistically add per month for the next several years. You can factor in a recession or not. It's up to you. Next determine how many jobs it will take per month to keep up with demographics. Bernanke thinks 125,000 but you also need to decide how many of those 2 million people who gave up looking for work decide to start looking again. Thanks to Ross Perez at Tableau Software for the above interactive map. I had this idea from the first moment I saw Tableau Software. A recently introduced feature, the ability to map user generated input, is what made the graph possible. 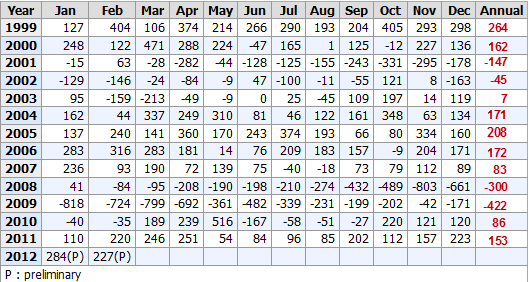 Assuming 150,000 jobs a month and a labor force rise of 125,000 jobs a month, the unemployment rate would not cross below 8% until April of 2013. Note the "Hover Over" effect. Put your cursor at any point on the line to see point-in-time details. If disgruntled workers come back into the work force faster than job growth, regardless of what that job growth is, unemployment will rise. In general, that would be a good thing economically were it to happen, but it could mean a difficult time for those expecting the unemployment rate to drop as it has over the last couple years. Regardless, I see no reason to deviate from my "Structurally High Unemployment For a Decade" call made years ago and reiterated in January in Fundamental and Mathematical Case for Structurally High Unemployment for a Decade; Shrinking Job Opportunities and the Jobs Gap; The Real Employment Situation.